I get daily email from people suffering shoulder injuries all over the world. Many have questions regarding their MRI reports that somehow go unanswered by the MD or just are not explained clearly enough. Sound familiar? One such email yesterday described an injury as a slat tear. I knew the customer probably meant SLAP tear even though he did not know the true description. Face it – deciphering MRI reports is like reading a foreign language unless you have medical training. Many people suffering from rotator cuff tears/tendonitis may also be suffering from a SLAP injury as well. What does SLAP stand for? Superior Labrum Anterior to Posterior to be exact. Even more confusing, right? Think of it simply as an injury to the long head of your biceps tendon as it joins with the glenoid labrum (shoulder cartilage) in the top of your shoulder. This is actually more common than you may think. It can occur through a traumatic injury (fall for example) or through gradual stress/degeneration. The long head of the biceps tendon assists the rotator cuff in depressing the humerus during elevation of the arm and overhead activities like throwing. In my experience, SLAP tears often require arthroscopic surgery to repair them in order to restore function and eliminate pain. If you have a torn labrum, minimize overhead stress or extending the arm fully beyond the plane of your body, especially with a straight arm under resistance. Exercises in the gym that would place harmful stress on the labrum include full range bench press, military press, incline biceps curls, dips, upright rows above 90 degrees, and deep push-ups or flies and pull-ups. To rehab this injury conservatively, you should focus on scapular stabilization and rotator cuff strengthening, always taking care not to load the shoulder joint with significant weight at end ranges of motion. I included a screenshot from one of my webinars of a few scapular strengthening exercises guaranteed to improve your shoulder function if you have such an injury. It includes a prone serratus punch progression (starts on the knees and advances to the toes) to increase serratus anterior strength, a muscle often shown to be weak and lacking endurance in those suffering from shoulder pain. 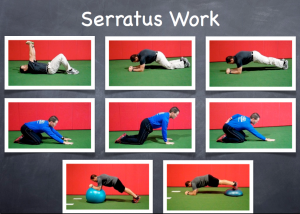 You will also see some quadruped rocking and advanced progressions of the serratus push-up using a BOSU trainer and BOSU ballast ball. I offer an on demand webinar on SLAP tears at www.alliedhealthed.com. It includes anatomy, rehab, surgery and current research updates on the treatment of SLAP tears. Dangerous and bad exercise given the architecture of your shoulders – I suggest NOT doing these anymore. Would a biceps tear at the origin/labrium tear cause discomfort in the scpula area and around the neck? I do not do dips anymore, simply because I cannot do them without the feeling that my RC will be torn of the bone. It literally feels that bad. If someone lives with a slap tear without it being fixed, do they usually experience pain in the scapula area? I am experiencing a constant burning sensation in the scapula and upper trap area. My doctor says my tear is very small but I cannot help but feel this painfull sensation which never seems to go away. It is possible it could be a trigger point in the infraspinatus or scaleni as they can cause pain in the scapula. That is one scenario. There could be others including irritation of the suprascapular nerve. I am throwing out options not diagnoses here as again I am not seeing you in person. You could have posterior shoulder pain with a labral tear but normally bicipital pain will be along the front of the shoulder and upper arm. Six months ago I developed a labral tear, biceps tear, and frozen shoulder after strenuous exercise. An MRI confirmed the tears. I did physical therapy for five months and had two cortisone shots. The only significant symptom I now have is periodic daily biceps pain, typically at rest, not during exercise, which I have kept to a minimum. On a scale of zero to 10, the pain varies from zero to 3 or 4. Some days it is near zero for most of the day. Other days, it is bothersome throughout the day. Questions: 1) Will such pain eventually go away on its own? 2) Will surgery likely reduce the pain to zero? 3) What should I be doing now? My doctor had me discontinue physical therapy after it didn’t help any further. 4) Should I do surgery? Labral pain will not likely subside but it is often better with rest or avoidance of strenuous exercise. Surgery can be effective in most cases but some docs feel a biceps tenodesis or tenotomy is necessary to predictably relieve the biceps pain. I suggest continuing with rotator cuff and scapular exercises to maximize function. I cannot make a surgical recommendation but suggest seeking a second opinion from another physician for this. I think if you want to go back to lifting heavy you will likely need to get it repaired as the pain will continue to limit you. Understand I cannot recommend surgery – only your physician is qualified to do that. In my opinion, it may be wise to make some general modifications when you do go back but this is probably the best step to get back to full function and bodybuilding. Have you been evaluated by a PT or doctor yet? If not, I would start there to make sure you are on the right track. I am now 8 weeks post-op from my SLAP repair (2 anchors needed). I’ve been in PT 2-3 times/wk since about 2 weeks post-op and am still working on ROM. I saw the surgeon the other day and he said that I’m where i should be with my recovery. I’ve noticed recently, just in the past week or so, that i have achy bicep pain that varies in intensity. The other night, for the first time in awhile, i woke up with pain that was bad enough that i took a pain pill (morphine) for the firt time in about 6 weeks. (Since 2 weeks post-op i’ve only taken Advil or Aleve but take them regularly.) The pain was concentrated in my bicep area and not so much in the joint. Yesterday at PT i mentioned this and the therapist massaged my bicep and worked out the knots. It hurt but felt better afterwards. The achiness is better today but it’s very sore to the touch. I forgot to ask the Dr. about bicep pain and I’m curious if this is a fairly common thing with SLAP recovery? Should my physical therapist (or a massage therapist) be massaging the area regularly now? Do you know what could be causing this? Is it just part of the healing process, or from the muscle starting to get more use after being relatively dormant for awhile? This is for those of you who are wondering whether to have surgery for a SLAP tear. I’m 47 and had been doing yoga, weight training, and cycling pretty consistently for about 6 years until about a year ago when I was laid up with a foot injury for a few months. Went back into the gym last Spring and started getting a pain in my right shoulder after doing relatively light weight/high rep bench and inclines. I rested it for a week or so and when it seemed to be getting better I started doing push-ups again. Big mistake. After a couple of months of pain I went to see an orthopedic surgeon and had xrays and MRI and was diagnosed me with a rotator cuff tear, arthritis and a bone spur. He recommended surgery. I got a second opinion. The second doc recommended anti-inflammatory meds and phys therapy. Tried it for a couple of months but the pain just kept getting worse. I went back to the first doctor late last Oct. and had him do the surgery. He found a SLAP tear that had not shown up on the MRI (the rotator cuff was not too bad) and, based on my age and desired level of physical activity, he decided to perform biceps tenodesis. I had no idea he would do this as we had not discussed it prior. He explained that my tear would never have healed on its own and I would never have been able to go back to my same level of activity as before my injury without pain, if at all. He said that with the surgery I had the potential to be back to near 100% in about 1 year and would be able to do everything I did before the injury. He said, once healed, the attachment may even be stronger than before since now it was attached directly to bone instead of the softer cartilage material. Sounds great, right? So now it’s been 3 months post op and I’m just beginning to do light strengthening exercises. I still have pain in my shoulder, but it is way better than before the surgery. I have near full range of motion and I can sleep on my injured side again with minimal pain. I have only one regret about the surgery: my arm is now somewhat deformed. The bicep muscle dropped a couple of inches. It does not look the same (or yet feel the same) as it did before. My doctor tells me that it is not as bad as it would be if they had performed a tenotomy instead as the biceps would have dropped even further. He also tells me that the deformity will be less noticeable as I build muscle back. Time will tell. People who’ve seen it say they don’t notice it, but to me there is a huge difference. But, as my doctor put it, the point of the surgery was not to make me look good, it was to get me back to a point where I could return to my previous level of physical activity. I hope this helps anyone face with a similar situation. It is not uncommon to have soreness during the rehab. Was the biceps left alone or did the doctor do a tenodesis or tenotomy (release)? Some patients still have biceps pain after surgery for a while. As far as the massage, some soft tissue work to promote blood flow and healing is fine but it should provide relief and not increase pain. Thanks for sharing your comments as I think they are useful and it helps others to read first-hand experiences. The issue with any tenodesis or tenotomy is cosmesis as you point out. However, my gut feeling and updated information seems to indicate that long term you will have a better outcome in terms of pain relief and function. The long head of the biceps (the portion that was tenodesed) is not a major contributor to function or strength. It is the short head that attaches below the elbow that is critical for supination and elbow flexion. Many older people (esp. men) will suffer a proximal biceps tear naturally in life with vigorous activity and this does not require surgery but does leave what we term a “popeye” muscle as the upper biceps peels off leaving a balled up muscle closer to the elbow. Keep up the rehab and I bet you will be quite pleased with your function and pain levels in the next 2-3 months. Best wishes for a full recovery! Thanks for the reply Brian. I did not have anything done to the biceps with the SLAP repair. I guess the muscle is getting more use now. While on the subject of the bicep muscle…I’ve always had strong, fairly defined (for a woman) arm muscles and now the surgical one is like a blob of jello. I’m still doing only ROM exercises and it sounds like it’ll be awhile yet before i can begin any real strengthening exercises. Based on your experience, how long would you say it can take to get full strength and definition back? My PT is saying a year post op for full strenth but even longer for definition. I’m not a body builder, i just don’t want flabby arms. I’m only 17 years old. I played soccer for 3 years and in the last year I was playing when a girl ran into my left shoulder and I felt it crack really loud but Ikept going but by the end of the first half I was in some pain so the coach put ice on it. The pain came and left but it never got to bad. I have been like that for almost 2 years now. The pain and the cracking seem to be getting more intense. Most movements that I make with my left arm make a cracking noise. I finally went to my doctor and she refered me to an orthopedic surgen to see what I had with my shoulder and he says it’s probably nothing bad but that I should get an MRI. I am now waiting for the results. These past 2 years my shoulder has craccked really loud that people around me can hear it and it starts hurting shortly after it cracks. I can’t sleep on that shoulder because my humerus begins to hurt. I was googling shoulder pain associating my symptoms and this came up so I read it. My concern about my shoulder pain is that it hurts when I throw, carry something over 2 pounds, lift my arm up or move it back which made question whether this could be somehing I could possibly have. The orthopedic doctor said that because I haven’t done sports in some time and because of my age, I shouldn’t have anything bad but I was wondering if this could be a possibility. Can a slap tear injury to the shoulder come from getting hit from behind by a rubber raft maybe weighing about 20 lbs? The raft came off a conveyor belt maybe about 2 or 3 mph then struck me in the back of my neck and shoulder area. I was sitting on a raft of a waterslide park getting ready to go down on the slide. The impact kind of knocked me forward and I felt pain in my neck area at first and then after a couple of days I started feeling pain in my shoulder. It is hard to say for sure, but I think you will have good functional shoulder strength within 6-12 months. Definition of the biceps/shoulder should follow a similar path. I generally think it takes most people 1 year (in some cases up to 18 months) to get back to as close to normal after shoulder surgery. With that said, provided you are strengthening 2-3 times per week I would think visually it should be better within the year. Based on your comments, it could be a rotator cuff issue or labral problem. Provided the shoulder did not sublux, you could rule out recurrent instability. The popping could be due to inflammation or soft tissue rubbing inside the joint. The MRI should be helpful and provided they used contrast it will rule out a labral tear as well. Yes, that is possible. However, the neck can refer pain to the shoulder so you would want to rule that out for sure. Issues at C5 refer pain to the deltoid region and this can be confused for shoulder pain. I would suggest seeing a medical professional to examine the problem. Hi my name is michael and i am 15. I just got my MRI back and i have a SLAP type 2a tear. My parents think surgery is the worst thing ever and won’t allow the doctors to operate. They think it can heal on its own. Can it? and if so how long do you think that would take. I injured my right shoulder about 5 years ago after years of weightlifting. After a heavy shoulder workout, the next day my shoulder felt very weak and I could barely hold a door open, or bench a warmup set. The shoulder slowly healed, but for years I dealt with instability and fatigue, even from minor things such as writing on a piece of paper for a period of time. I tried rehab, had several cortisone shots and tried rounds of prolotherapy, but to no avail. I finally saw an ortho surgeon last summer and he said I have sublaxtion, caused by an expansion of my rotator interval which resulted in the long biceps tendon not being properly secured. He also suspected a SLAP tear. I had an arthogram MRI, and the doctor said there was no tear, but I still needed a surgical procedure known as a anterior rotator interval closure to stabilize my shoulder. I had that surgery last fall. I’m now 4 months post-surgery, and my shoulder feels somewhat more stable, but still not as good as it felt before the injury, and still fatigues more quickly than it should. I’m wondering if after years of dealing with a bum shoulder, there was degeneration to my long biceps tendon, which accounts for this continued fatigue. I would have to assume that the tendon has been compromised since I have pain in the front of my shoulder, but there was no tear. If so, can you recommend any particular strengthening exercises specifically for the long biceps tendon? The exercises given to me by my shoulder are typical for a rotator cuff injury, but I’m wondering if there is anything specifically suited to strengthen this particular tendon. Slap tears do not heal on their own. If you are an overhead athlete this will continue to limit and bother you in sports. The next few days, my should hurt so bad it was keeping me up at night. My shoulder finally felt better, but my chest (left side) began to hurt. Not a heart-related pain, but (I think) musc/skel. I’m not sure if it is the 2nd, 3rd or 4th rib, but it hurts to the touch. If I take a deep breath I can feel it, but if I press on it, it hurts quite a bit. Is it possible to fracture a rib, or separate muscle by throwing a football? The long head of the biceps is more active with incline bench dumbbell curls. This is because the shoulder is placed in extension and maximally stretched. Be cautious as this position can strain the long head if there is any inflammation or pathology present. Hopefully, the pain in the shoulder will subside with continued work on your rehab program. It is possible you could have strained a muscle (intercostal for example) that would cause pain with breathing and be sensitive to touch. You also have cartilage between the ribs and if there was an injury at the costochondral junction this could be quite painful as well. Most of the time, people with this history of injury are experiencing something related to the rotator cuff ad or labrum, but the pain along the upper ribs and issues breathing may indicate otherwise. I would have it checked out if you are still having exquisite pain as a muscle strain should have healed by now. It is possible the surgery failed (labrum is torn again), arthritis could cause pain, or perhaps there is another issue such as rotator cuff pathology or irritation of the biceps tendon. I could not say for sure. I work out at the local crossfit and have done so for about 5 months now. Back in December I noticed intense pain on the right side of my upper back into my right shoulder and upper arm. IT only occurred when I did overhead workouts like push press, shoulder press and overhead squats. I could continue doing pullups and pushups with no pain. I had two muscle tension knots form that my kinesiologist worked out for me. I had an arthroscopic mri with a corticosteroid injection. Prior to the mri the dr was sure that I had a torn labrum. The mri was negative. I took 4 weeks off from the gym and it seemed things were going good. However, last week we got back into overhead workouts and it started bothering me again, this time worse then before. To the point that vacuuming even hurts it. The pain seems to be on the lateral side of the thorax, right at the posterior arm pit, radiates to the upper shoulder and scapula. Any insight on what you may think could be causing this? Should exploratory surgery be performed. I am 24 years old with a 16 month old daughter. I am also a firefighter/paramedic. I am not a bog fan of exploratory surgery. Overhead activities typically causes irritation in tissues like the rotator cuff and glenoid labrum. An MRI with contrast is the most reliable way to see a labral tear. Injections typically don’t help with labral tears in my experience. If you have any subtle shoulder instability, this can also cause stress on the shoulder in the overhead position. Have you tried any formal PT? My daughter plays a significant amount of tennis (15+ hrs per week). She is 18 and will be playing in college starting this fall. About 2 years ago she started experiencing upper arm/shoulder pain mostly related to serves and overheads. During the past two years she has made frequent visits to physical therapists. They say that from years of tennis her body is not balanced. The therapist she sees the most works with other tennis players (including pros) and insists that surgery is not necessary but that exercise and continued “adjustments” during her therapy to help balance her body will eventually correct the problem. My daughter visited an orthopaedic surgeon and after conducting a series of tests concluded that there was a possible SLAP tear. She then had an MRI and the orthopaedic surgeon said that everything looked normal except that the posterior superior labrum looked irregular and may have a small cleft tear. But he admitted that he was not certain. He initially did not want to recommend surgery, but when I reminded him that this has bothered her for nearly two years (and she has already been through a fair amount of physical therapy) he said that the only way he could be certain if it is a small tear would be to scope the shoulder. If he saw a tear he thought he may be able to insert one anchor to hold it in place (he said it was small enough that it would be at most one anchor). Since my daughter starts playing in college this fall we want to make sure she is ready to play (or at least practice) with the team in September. Do you think we should go forward with the surgery or continue with physical therapy to correct any imbalance and strengthen the appropriate muscles as the physical therapist recommends? We’ve been told that the recovery time for the surgery would be 3-4 months in her situation. Do you agree with this? If the shoulder is scoped and they do not find any tears (and therefore do not insert any anchors) how long of a recovery would there be just for this procedure? FYI – she also tried visiting an accupunturist. His assessment is also that there is no tear (but recommended the MRI) but that the body is out of balance. After a few accupunture sessions she could hit 10-12 serves without any pain, but then it would slowly return. We do not understand why the pain would dissapear for 10-12 serves if there is a tear. Perhaps we should continue with more accupunture therapy also? Was the MRI done with contrast? An MR arthrogram is the most accurate measure we have to assess these. Hopefully they used this. I would agree that balancing the body makes sense. I always begin with a Functional Movement Screen with all my high level athletes like your daughter. This unveils any movement flaws and obvious asymmetry. This is the basis for corrective exercises. I am sure the PT has her doing lots of rotator cuff and scapular work as well. This along with hip and core stability are essential for injury prevention. With respect to surgery, I always like second opinions as SLAP repairs are never a walk in the park. A 3-4 month recovery is normal. We usually let thrower start back to light toss around month 4. The biggest issue after this procedure is getting full motion and alleviating pain as soreness can linger. If the scope turns up nothing, she will recover quite well from the scope in 3-6 weeks. Keep in mind every case is different as is the skill level and experience of surgeons/therapists. With regard to acupuncture, I am not certain about continuing versus not continuing. She may have not felt pain with the first few serves since it was early on or perhaps there could be a placebo effect as well? I am not against acupuncture in any way but do not have lots of experience evaluating its effect on my athletes either. I have seen it used most in neck/back pain with mixed results. I think your next step would be getting a second opinion on the surgery if it were me. With that said, if the current pain limits her game and rehab has not fixed it yet, you have to consider whether the rehab is/will be effective at this point or whether the procedure is needed. Tough questions for sure. Getting more opinions may help in this case. Thanks for the feedback. Yes, the MRI was done with contrast (MR arthrogram). I forgot to mention that the Orthopaedic surgeon put her on some very strong anti-inflammatories to see if that makes a difference. He will see her again 6 days prior to the scheduled surgery at the end of this month to re-evaluate her. (The PT had suggested that the surgeon give her a prescription for these. She normally does not recommend this, but felt that there could be some swelling that is contributing to the problem since she feels a misalignment is causing rubbing). We also have an appointment for a 2nd opinion with a Dr. Nirschl on Monday. We will see what his opinion is. My daughter will also see the PT twice a week until the surgery. Up until this point we only went in for PT about once every two weeks or even less frequently. I was diagnosed with a slap tear about August of 2010. I was playing baseball at the time of the injury occurred. I went through the whole procedure of MRI and all the doctor visits to see what my options were. I was a freshman in high school and throwing in the high 80s to low 90s range. I was told I needed the surgery if I ever wanted to play again so I did. I went through 7 months rehab and everything was going good, but now I don’t have the velocity I once had and sometimes I get sharp pains in my shoulder when I throw.. so, do you have any exercises I should do or do you recommend going back to the doctor? Sounds good. You are taking the right steps at this point and glad you are getting the second opinion. Research has shown that not all high level pitchers get back to 100% after the repair (meaning some loss in velocity). You should be focusing on a comprehensive program – I start with a Functional Movement Screen and work my way from there. Your PT probably has you doing rotator cuff and scapular exercises, but just as important will be hip and core training. Find someone to do the FMS eval and get any corrective work done. See you doctor for questions on pain follow-up. Some soreness at this point is not surprising as in my experience shoulder pain after this procedure can linger for at least a year esp. with heavy throwing. I am a 36 year old male, 511, 185. I’ve been doing P90X and weightlifting for about 5 years. I recently hurt my right shoulder while either lifting weights or throwing a football, or both. I can’t remember exactly when I injured it, but I went to Airrosti and had a month of deep tissue therapy and physical therapy they prescribe. It’s been 3 months now and just by reading all these posts/responses, I believe I have a SLAP tear. My symptoms are that I have pain when I roll over while sleeping(not enough to keep me from resting), clicking/popping when I lift my arm up a and down in the front while outstretched, and most of all I miserably fail the O’Brien test. What’s crazy is that while I stopped weightlifting, I can still do pushups, pullups, overhead presses(with 30lb dumbells) with little or no pain. I’m not saying I don’t have pain at all because I do. It doesn’t hinder me from lifting and going about my day to day, but as an active person who loves to work out, it has become quite a hindrance. Please advise. I would suggest getting an MRI with contrast to definitively find out. Then you will know exactly what you are dealing with. Do you think I should stop lifting dumbells and doing pushups and pullups? I would use pain as your guide (anything over 3-4/10) is too much. With that said, keep in mind pull-ups and pressing where the arm moves beyond the plane of the body will place stress on the labrum and long head of the biceps. I would be cautious until you know the extent of the injury. If I have surgery will I ever be able to do pushups, pullups, overhead presses again? I’m just afraid I won’t be able to do what I love doing ever again. Play basketball? I am a college softball player and I have had pain in my shoulder when throwing. My coach has made me sit out because of it. my shoulder pops and grinds and hurts when say I scratch my back and it feels like a deep pain that I want to dig at. I haven’t done any throwing in a month and it had still been bothering me sometimes when not doing anything. Our trainer thinks it could be labral issues from the tests he did. Do you think from this information that it is my labrum? Brian, i recently suffered an antrior shoulder dislocation that had to be closed reduced at the ER. I had an Mri followed by an arthrogram. The MRI findings were compatible with an anterior dislocation. Hill-sachs fracture, high grade inferior capsular tear, tearin throughout the anterior inferior labrum without separation. Also revealed a SLAP tear which appears to be small). I used to be a hight elite volleyball collegiate and professional player for years. I imagined the SLAP tear is old. There was also evidence of a very small posterior labral tear with cyst formation which also is as a result of a likely prior injury. Before this injury I NEVER had any pain nor problems with this shoulder. It is my dominat hand and I am 37 years of age. I saw 4 sports shoulder specialist in the area an all gave somehow different recommendations. One told me to rest for 3 months. No PT or nothing. He said that if the pain continues then surgery. The second one told me to get it fix as the fact i had labral tears the shoulder was unstable and the likelyhooh to dislocate the shoulder again is in the 80 percentile. The third one told me to try PT for 4 weeks to see what happens but also recommended to get it fix down the road. The 4th told me that is a 50/50 chance that therapy can help but I will always have the potential to dislocate thw ahoulder again and is further dislocation happens I can furthe damage the cartilage and the rotator cuffs. He also told me to wear a sling for 4 weeks followed by therapy if surgery is not considered. As you can see all of them like to treat them differently. I am inclining to get the surgery even if is my first dislocation as it appears as i have a diffusse labral damage from previous an recent injury. My rotator cuff muscles are intact and thwe bicep muscle is normal. The truth is that the MRI is two dimensional and sometimes a labral tear would not bee seen on a plain MRI. Is like seeing a piece of paper lying on the table from an upper view. It looks as in place but is easely moveable. That is why a MRI with contrast is so essential prior any intervention. The small Slap tear i have was not seen on the plain MRI but visible on the arthrogram. I already met with a shoulder specialist therapist to work on my rehab. I am sooooo fearful of the surgery and potential frozen shoulder. I’m I making the right decision? IDK. Time will tell. Im just dont want to go through another dislocation. That is nooo fun!! Extremely painful. I truly just want to get it fix. Im in the medical field(you be surprise). All of this doctors are friends. Brian, what do you think? Congrats on your helpful blog. Yes you would be able to do them again. Yes, you could play basketball as well. It sounds like it would either be rotator cuff or labral but hard for me to say for sure without examining your shoulder myself. Also, if i have the surgery, when can I start working on the scapular strengjtening? All of course expecting to go according to plan. Does 3 weeks of immobilization is enough to cause a frozen shoulder? What is your experience on that? Is 10 degrees of external rotation loss is significant? I was told this can happen with this type of surgeries. My good shoulder i can do close to 90 degrees of external rotation. I want to be able to play tennis 1-2 /week and basketball 1/week. I think statistically speaking the risk for recurrent dislocation is lower than if you were under 30. However, my concern is more related to inferior damage as instability in this region is tougher to withstand in many cases. The additional labral damage only serves to contribute to potential instability. Your presumption about the SLAP tear may be right but hard to know for sure. If you want to do high level activity (volleyball and other overhead activities) you are increasing your risk for subsequent injury. Without seeing you, I would suggest trying the rehab first and seeing how you do as you advance to higher demand work. If you are unhappy after 4-8 weeks, then you can opt for a repair. Surgery is never a sure thing and frozen shoulder is always a concern after a SLAP repair. The other issue is motion – you may not get full motion after a capsular shift or repair. I applaud you for gathering multiple opinions and wish you all the best. The answer to these questions depend on the surgeon, procedure done and the repair/quality of the tissue. In many cases, we start some light scapular work between 4 and 6 weeks post-op (not heavy resistance) by any means. In the most conservative scenarios, you would wait until week 6-8. I see surgeons immobilize people anywhere from 3-6 weeks. The key to avoiding the frozen shoulder is early controlled passive range of motion. The doc will restrict ER and flexion initially to protect the shoulder. Losing 10 degrees of ER would matter a lot if you made a living hitting balls, but t will be less of a detriment in life now. You may lose some power and velocity on serves, but you would be fine for activities of daily living. I am 24 years old and an MMA fighter. MRI showed a SLAP II lesion tear and a small partial cuff tear. Seeing Shoulder specialist tuesday. Am in great shape, 2 weeks out of a fight. had shoulder pain before the MRI but pain went away and i have full ROM. Am thinking about getting the surgery but would like to get back to training to fight before the summer. How long could I expect to start hitting the back again, not sparring? I never like to predict for sure because I do not know the surgeon or procedure (debridement versus repair) but I would speculate that you could begin hitting the bag again around 3 months post-op. It may be a little longer than that but you would have to check with your doc to be sure. You enter the minimum protection phase at this point so doing it sooner may expose the tissue to undue strain. With a repair, you want to make sure it holds.